Whether you are a training manager, learning & talent development consultant or an eLearning designer, it is now time to take a fresh look at your audience. They have changed! The Millennials are everywhere, and they make up the lion's share of your audience. The Millennial generation or Generation Y is made up of people who were born between 1982 and 2000. They were born into technology and grew up tinkering with gadgets and video games. They prefer to express themselves in 140 characters instead of writing an email. They think and learn differently than the Baby Boomers. So it is no wonder that you have to revamp your training to catch their attention, hook them, and make them come back for more. 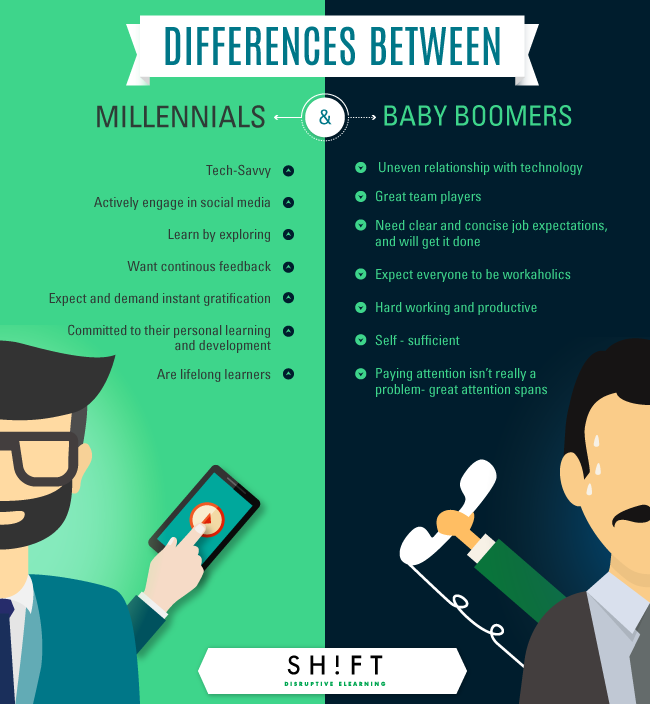 Millenials know more about and have handled more technology than the average Baby Boomer. So you cannot win over the typical Millennial by dishing out trashy content packaged attractively (you think so) behind a façade of snazzy graphics and glitzy digital effects. Being online and accustomed to communicating via social media, the typical Millennial craves engagement. He or she doesn't like being talked down to. You have to create courses that talk to him or her and provide ample opportunities for interaction. Millenials are social and mobile people. They have an 18-hours-a-day-consuming-content culture. They are always on and they expect to be able to work anywhere at any time and on any device. So, making sure learners can access your training anytime and anywhere is fundamental. These learners don't want more lengthy lectures or rigid schedules. Millenials are past their high school and college days when learning was all about attending long and tedious (read: yawn-inducing) one-way lectures. Millennials want to go on adventures. Give those to them through your courses, and you’ll have them come back for more. Create eLearning courses that not only hook them but also let them interact and explore. This is one of your biggest challenges when you have to create an eLearning course for the Millennials. Millennials want relevant content and fast. They want to take only those courses that provide value and help them enhance their workplace skills. Be assured that your course will be under scanner the moment they are inside it. If you cannot hook them with meaningful content or convince them of the relevance of your course, be prepared to lose them. Since childhood, millennials have been congratulated for their efforts and receive individualized attention. Therefore, effective eLearning courses should provide feedback to learners regularly about their progress, what they have mastered, and if they have met certain goals. Providing continuous SMART feedback will motivate learners as they progress through the course. So, Why Should Learning and Development Professionals Care? The Millennials are set to become the biggest workforce in the United States by 2025. They will make up a whopping 75 percent of the workforce, which is more than 50 million. Your training programs HAVE to get the nod from them. The Millennials tend to advance up the corporate ladder faster than their predecessors. The Millennials are generally more educated and quickly assume leadership and managerial roles in the organizations they work in. So expect your courses to be commissioned, taken, and evaluated by Millennials. Millennials are more achievement-oriented than the Baby Boomers. They work hard to bag their certificates, so they can move up the corporate ladder quickly. So keep churning out courses fast because your audience is hungry to learn more. Millennials hop across companies more than Baby Boomers. As many as 6 in 10 Millennials change jobs in less than three years. With Baby Boomers gradually retiring, the cost of attrition—between $15,000 and $25,000—is a burden that weighs down many companies. So companies are being forced to cater to the demands of Generation Y: provide training opportunities to nurture their talents and build marketable skills that will help them advance their careers within the organization. As an eLearning professional, you have to ensure that you meet the increasingly diversified training needs of Generation Y.
Millennials are technology-literates. They prefer to consume digital content rather than turn the pages of a book or listen to hour-long lectures. So they matter to you because they are the biggest consumers of your products. Your work is cut out. You have to not only create courses in greater numbers but have to also package them in a way that suits the distinct learning styles of the Millennials. You need to delve into their minds to know how they tick and what puts them off. Bottom-line: Your eLearning courses should be millennial-friendly! The Millennials are not only a generation apart from the Baby Boomers. They are also a world different from their predecessors. They have very different learning expectations and preferences, and you will have to think out-of-the-box to create eLearning courses that appeal to them.